An independent body set up to consider Australia's official target of generating 20% of its energy needs by 2020 from renewable sources has rejected calls from incumbent utilities and heavy industry to scale back the target. In its first major publication since its inception in July, the Climate Change Authority (CCA) on Friday said altering the target would harm investor confidence. It recommends that the fixed large-scale RET target of 41,000 GWh per annum remains unchanged, and its full recommendations were included in a 150-page discussion paper as part of a wider review of the RET by the authority, which is due to be finished in December. 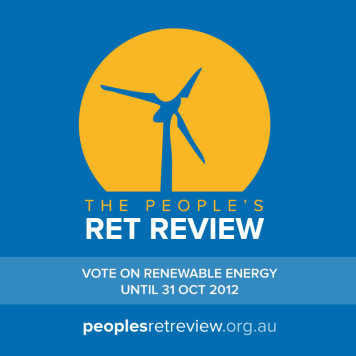 The RET, which enjoys support from both the ruling Labor Party and the opposition Liberal-National Coalition, met significant opposition from companies such as utilities Origin Energy and Energy Australia and the Business Council of Australia. Opponents wanted the set target cut because it would overshoot, resulting in higher industry costs. “The challenge is to strike a reasonable balance between encouraging further investment in renewable energy — leading to ongoing reductions in greenhouse gas emissions — and the costs to the scheme to households and business consumers of electricity," said CCA chairman Bernie Fraser. Australia’s renewable energy industry congratulated the authority for recognising the importance of policy stability, saying it had understood the key issues confronting the industry. “Retaining a fixed target as drafted in the legislation is the best outcome for companies and investors who are looking at renewable energy projects between now and the end of the decade,” said CEC deputy chief executive Kane Thornton. “Every review of this policy has shown that the RET is the most efficient, low-cost and effective way to deliver what Australians consistently say they want - more clean energy. But every review has also stifled investment and created uncertainty due to the prospect of serious policy changes,” he added. A report released prior to the CCA discussion paper by the CEC and economists SKM MMA found that Australia’s economy stood to gain an additional A$18.7 billion ($19.4 billion) in investment under the RET. “The renewable energy target has been an extraordinary success and must be maintained,” said John Grimes, chief executive of the Australian Solar Council. “It will help build many Big Solar plants in Australia over the next decade." The CCA also recommended the RET be reviewed every four years, rather than every two years, to ensure certainty for investors. This decision should pave the way for some 8 GW of wind farm developments and up to 3 GW of large scale solar over the next eight years. Climate change minister Greg Combet said Australia’s policies to lower emissions and promote renewable energy may drive investment of A$100 billion ($104 billion) in the next four decades. The government has set a price of A$23 ($23.8) per metric ton on carbon emissions for about 300 of its largest polluters for the year that started on 1 July, with a market-based system scheduled to begin in 2015. By 2020, Australia is targeting 20% of its energy needs from renewables. Back home, what is Malaysia's RE target in the energy generation mix? By 2015, Malaysia targets to generate 5.5% of its total power needs from renewable sources. Prime Minister, Najib Razak said this during his keynote address at IGEM 2012 recently. Mesti Wak selalu pegi australia kan?